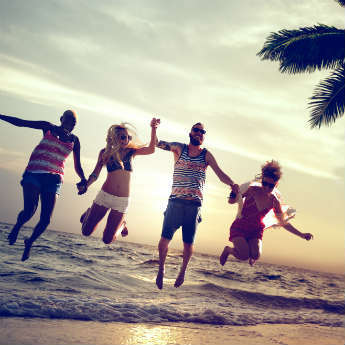 Q1) What's the best spring-time holiday you've ever had? Where did you go & what did you do? Oooh that’s a tough one! Probably my Innsbruck to Venice mini voyage. Q2) Where's the best country or region for helping visitors to enjoy an action-packed holiday and really 'spring' into action? (Did you see what we did there? I do appreciate the pun! #HolidayChat A3: it's weird, but apart from photographs, I tend to not keep anything from trips. And everything I take initially is stuff that I'd potentially take for a night at a friends. I don't consider passport as a holiday item - it's my only form of ID! Sensible list: passport, phone and laptop. Q4) Share a tip or two for anybody thinking about taking a spring-time holiday! Where's good to visit? How can you keep costs down but enjoyment high? Costs down: avoid holidays, but also consider going on weekends where possible to avoid taking annual leave. Q5) Finally, share an image of a holiday you enjoyed during spring! Where did you go, what/who is the picture of and would you recommend the destination to others? Hired a car and drove from Kaunas to Klaipeda, stayed in a beautifully restored old rice mill on the dock and drove the length of the Curonian Spit to Nida. Join us on Wednesday 17th April 2019 at 8pm over on Twitter for our next #HolidayChat! Got a topic suggestion? Drop us a tweet - @icelollyholiday! Get our best deals straight to your inbox. Customise your holiday preferences and we'll do the rest!